“Congratulations to all the graduates and parents. You deserve to be here as this is a culmination of years of diligent work and sacrifice. Today, we are here to celebrate your achievements and more importantly, your journey - the journey that got you here. It is important to be aware of where you come from, your background and your past experiences, as that keeps you grounded. I may not know much about you, your journey or your story, but be sure, each of your stories matter. Each of you matter. The next phase of your journey begins here. You have so much to contribute to your family and to your country. 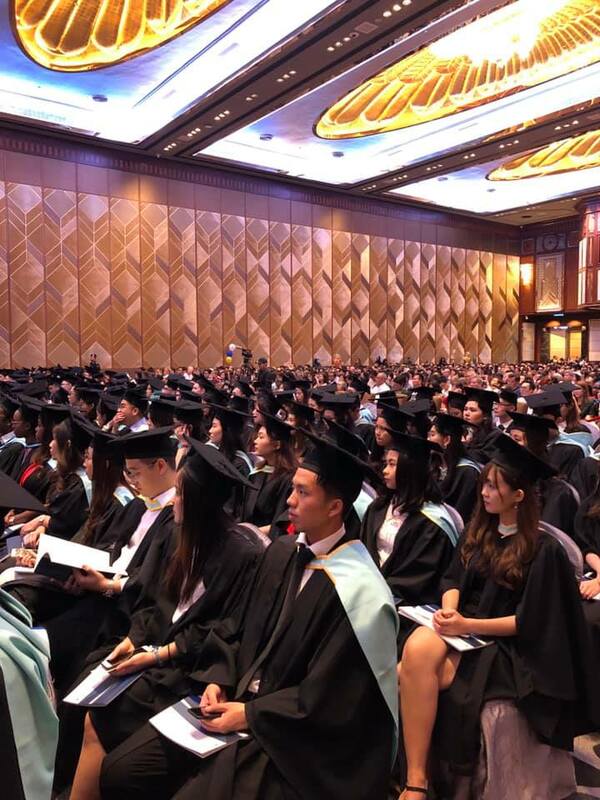 Each of us can make a difference in determining the direction of our respective countries,” said Tan Sri Datuk Dr Rebecca Fatima Sta Maria, Executive Director of the Asia-Pacific Economic Cooperation (APEC) Secretariat, during her graduation address on 6 April 2019. Tan Sri, who is the first woman Executive Director based in Singapore, touched on the importance of education and continuous learning: “If I had a magic wand and had only one thing I could change in this country, it would be its education. Nations rise and fall because of the quality of education”. Her statement was met with thunderous applause from graduates, parents and all those present. The successful conclusion to years of preparation and hard work could be seen on the faces of 897 graduates who received their graduation scrolls, with 27 PhD students completing their doctorates this year. “The effort you have made to reach this point deserve recognition. Today, the University certifies that you have acquired the analytical abilities, the deep knowledge of your field, and the capabilities that a Monash degree implies. We hope you have nurtured in yourself a love for discovery, that is expressed in the University’s motto - ‘ancora imparo’, which translates to ‘I am still learning’,” said President and Pro Vice-Chancellor Professor Andrew Walker in his commencement address. Don’t stop believing and never stop trying. Believe in your dreams and chase them.